(a) Using a screwdriver, disengage the 4 claws remove the bracket cover. HINT: Use the same procedures described for the bracket cover outer. (a) Using a clip remover, remove the 5 clips. HINT: Tape the clip remover tip before use. (b) Remove the bolt holding the fold seat stopper band on the vehicle side. (c) Remove the 2 headrests. (d) Remove the 5 bolts and seat. (a) Remove the 2 screws and 2 holders. 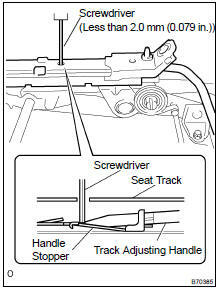 (a) Using a screwdriver, disengage the 4 claws and remove the seatback cover. (a) Remove the 6 clips and seatback board carpet. (a) Using a clip remover, remove the clip. (b) Remove the screw and reclining cover protector by pulling out the protector in the direction indicated by the arrow in the illustration. (b) Using a screwdriver, remove the claw and hinge cover by pulling out the cover in the direction indicated by the arrow in the illustration. (b) Using a torx) socket wrench (T45), remove the torx) bolt. 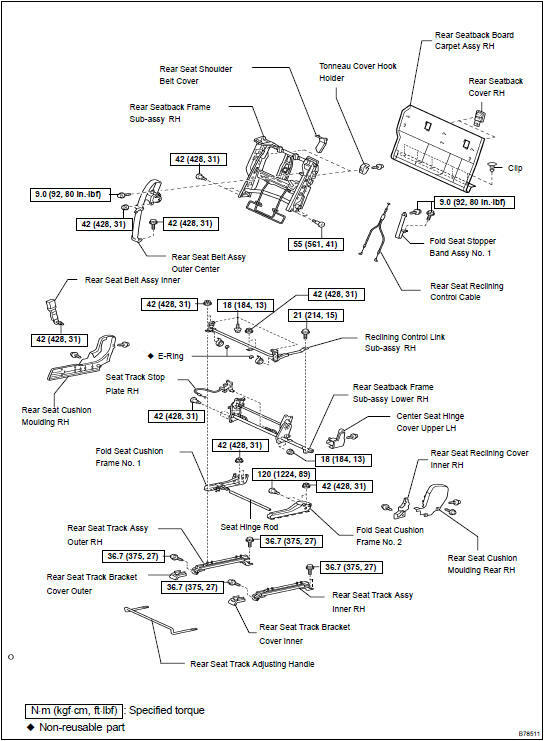 (c) Remove the 3 bolts and seatback. (b) Remove the screw and reclining cover protector. (a) Using a torx) socket wrench (T40), remove the torx) bolt and center back hinge. (b) Using a torx) socket wrench (T40), remove the torx) bolt and rear seat cushion spring No. 2. (c) Remove the 3 screws and moulding. (b) Remove the 3 screws and moulding. (a) Using a torx) socket wrench (T45), remove the 2 torx) bolts and armrest. (b) Disengage the claws and remove the seatback cover. (a) Remove the 2 screws and seatback cover. (b) Remove the moulding by pulling it out in the direction indicated by the arrow in the illustration. (b) Using a screwdriver, disengage the 3 claws and remove the moulding. (a) Using a torx) socket wrench (T45), remove the 2 torx) bolts. (b) Remove the 2 bolts and seat cushion. (a) Disengage the hook and remove the cushion cover together with the pad from the cushion frame. (b) Remove the hog rings and cushion cover. (a) Using a screwdriver, disengage the 2 claws and remove the control lever cover. (b) Remove the 2 screws. (c) Disconnect the reclining control cable and remove the control lever. (a) Using a screwdriver, disengage the 2 claws and 2 hooks. (b) Remove the shoulder belt cover by pulling it out in the direction indicated by the arrow in the illustration. (b) Using a clip remover, remove the 2 clips. (c) Disengage the hook and remove the seatback cover together with the pad from the seatback frame. (b) Remove the 2 bolts and seatback frame. (a) Disengage the 2 claws and remove the belt cover by pulling it out in the direction indicated by the arrow in the illustration. (a) Remove the bolt and stopper band. (a) Remove the screw and the reclining cover in the direction indicated by the arrow in the illustration. (a) Remove the 2 nuts and the seat track stop plate. (a) Remove the bolt, 4 nuts and reclining control link. (a) Using a torx) socket wrenches (T40), remove the 3 torx) bolts. (b) Using a torx) socket wrenches (T55), remove the 2 torx) bolts and seatback frame. (a) Remove the 2 nuts and cushion frame. (a) Using a screwdriver, push down the handle stopper to disengage the claw with the slide rail in the frontmost position. (a) Install the cushion frame with the 2 nuts. (a) Outer side: Using a torx) socket wrench (T40), install the seatback frame lower to the fold seat cushion frame with the 3 torx) bolts. (b) Inner side: Using a torx) socket wrench (T55), install the seatback frame lower to the fold seat cushion frame with the 2 torx) bolts. (a) Install the seat track stop plate with the 2 nuts. (a) Install the control link with the bolt and 4 nuts. (a) Install the seatback frame with the 4 bolts. (a) Install the stopper band with the bolt. (a) Using hog ring pliers, install the seatback cover to the seatback pad with new hog rings. (b) Install the seatback cover to the seatback frame. (c) Install the 2 headrest supports. (a) Using hog ring pliers, install the cushion cover to the cushion pad with new hog rings. (b) Install the seat cushion cover to the seat cushion frame. (a) Using a torx) socket wrench (T45), install the seat cushion with the 2 torx) bolts. (b) Install the seat cushion assy with the 2 bolts. (a) Using a torx) socket wrench (T45), install the armrest assy with the 2 torx) bolts. (a) Install the moulding with the 3 screws. (b) Using a torx) socket wrench (T40), install the center back hinge with the torx) bolt. 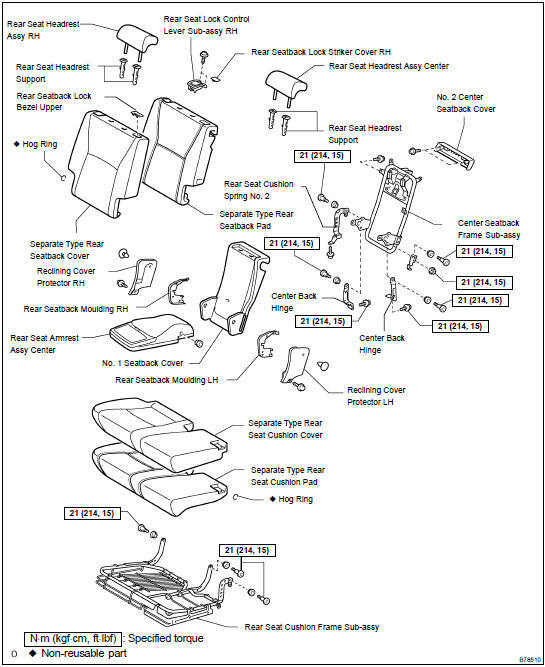 (c) Using a torx) socket wrench (T40), install the rear seat cushion spring No. 2 with the torx) bolt. (b) Using a torx) socket wrench (T45), install the seatback assy center with the torx) bolt. (c) Install the seatback assy with the 3 bolts. (b) Install the seat with the 5 bolts. (c) Install the bolt onto the fold seat stopper band on the vehicle side. (d) Install the 2 headrests. (e) When sliding the seat, check that both sides of the adjuster lock simultaneously. HINT: Check that the seat adjuster locks.